Home Movies Pakistan Iman Ali’s Wedding Ceremony Was A Dreamy Affair! 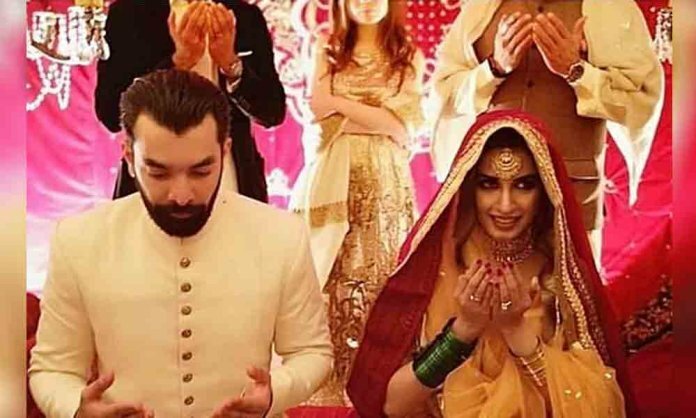 Iman Ali’s Wedding Ceremony Was A Dreamy Affair! The moment Iman Ali announced her wedding, it became one of the most awaited nuptials of the year. The model turned actress got Nikkahfied yesterday and we must say, the ceremony was undoubtedly one dreamy affair. The couple looked the loveliest and they enjoyed every bit of their moment with unconditional love. Iman Ali’s alimony (Haq Mehr) was set at 2.5 million (25 Lakh) and her fans are left in awe. The pictures of the ceremony are all over our newsfeeds and it speaks volumes of the priceless bond they share. The ceremony was attended by a number of celebrities and designers as well including Sarwat Gilani, Urwa Hocane, singer Farhan Saeed, Faraz Manan, Hassan Shehryar Yasin, Ali Xeeshan, Zara Shahjahan who also set the dance floor on fire. Every picture only comes across as an assurance that Iman Ali is the happiest bride ever! If this doesn’t melt your hearts then we don’t know what will! And here is the groom dancing his heart out! Iman Ali just made us say awwww! Urwa Hocane and Farhan Saeed also burnt the dance floor with their dance steps! And here comes Alizey Gabol on the dance floor! And here comes Sarwat Gilani! Ali Zafar and his wife also graced the ceremony! The announcement of Iman Ali’s marriage has undoubtedly come as a surprise to many of her fans and we hope to see our diva leading a happy married life as well. Did you like the pictures? Let us know in the comments section below.